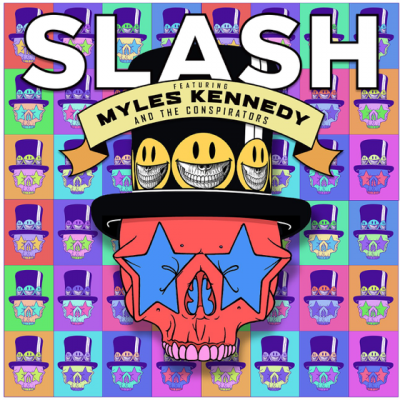 SLASH FT. MYLES KENNEDY & THE CONSPIRATORS will return this fall with their as-yet-untitled third studio album. The group-SLASH (Guitar), MYLES KENNEDY (Vocals), BRENT FITZ (Drums), TODD KERNS (Bass & Vocals) and FRANK SIDORIS (Guitar & Vocals)–has entered the studio with producer Michael “Elvis” Baskette (Alter Bridge, Iggy Pop, Incubus). Expect the group to announce a full North American tour for the fall. This same team worked on the group’s last album World On Fire, tagged by Guitar World as “another bold and unapologetically riffy statement” and “a varied, immersive and incredibly hard rocking effort” (December 2014). Rolling Stone described Apocalyptic Love–the band’s debut album and SLASH’s second solo release overall–as “filled with head bangers and plenty of fancy fretwork” and Revolver declared it “a collection of lean, high-octane rock-and-roll tunes built to be blasted out of open-top sports cars, or more suitably, open-air stadiums” (May 2012).